I was invited by Siobhan Davies Dance to curate an exhibition for their building around the topic of the photographic image and the moving body. It’s a privilege to have been asked and I’m excited by this opportunity to work with them in my capacity as Director of Stills. This exhibition has given me the chance to indulge my interests in specific aspects of art, photography performance. It’s fair to say that Fred Daniels’ photographs of Margaret Morris and her dancers from the 1920s and 1930s are the key inspiration behind the content of the display and the ‘foundation’ for the whole exhibition. These images are fairly new to me. I first came across them on a visit to the Fergusson Gallery in Perth, Scotland in 2014. Fred Daniels was a great friend of the Scottish painter J D Fergusson and through him he met Margaret Morris – an actor, choreographer, dancer, educator and founder of the eponymous Margaret Morris Movement. Morris commissioned Daniels to make photographic documentation of her work. They served a practical purpose as tools for teaching and illustrations for a book but they are also beautiful, expressive and unique images. Morris’s apparent belief in the importance of the visual documentation of her performance work interests me and I think the photographs demonstrate an early example of such an understanding of the legacy of live work. I know very little about the friendship and creative discussion behind these photographs but Daniels worked for Morris in the UK and abroad for more than 20 years and it was a close and respectful working relationship. I selected the artists Ruth Barker, Alan Currall, Romany Dear and Anthony Schrag because I decided to use the exhibition as an opportunity to focus on artists from Scotland, where I’m based. I had the idea to set their works amongst the photographs by Fred Daniels. Margaret Morris too spent much of her life in Scotland. All the contemporary artists work with the idea of performance and use their bodies in their work although some would not describe their work as ‘performance’ as such. I chose some works specifically but also invited the artists to put forward suggestions for the exhibition or to make new works where possible. 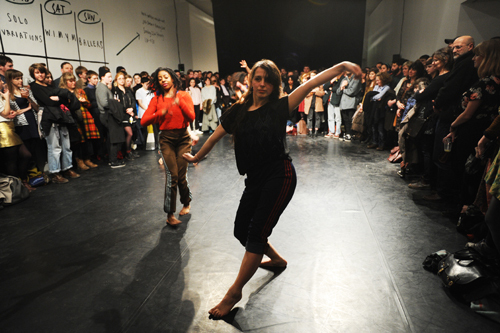 Do you think documentation of dance can present an authentic experience of a work? It depends what form the documentation takes and how it is used but I think it is extremely difficult, perhaps impossible, to replicate. But we have moved on a lot from a reliance on black and white photographs! Documentation can always offer an experience of a live work that is close to the authentic one. The exhibition has made me realize that artists are always finding ways to deal with the perceived shortcomings of documentary media to capture something ephemeral. And why the title – South of No North? I wanted to use something with a literary reference but that would also reflect something of the character of the exhibition – it’s also the title of a 1973 collection of short stories by Charles Bukowski. As a title to represent an investigative display into art, performance and documentation, with artists based in Scotland exhibiting in London, it feels about right. Ruth Barker and Romany Dear will perform live works in the gallery on 3 October, 7pm.